The staff and location are fantastic here. They can't do enough for you and the meals are far better than at any other youth hostel we have stayed at. When would you like to stay at YHA Ilam Hall? This 17th Century gothic manor sits in 84 acres of National Trust parkland, with the beauty of Dovedale just on its doorstep. The beautiful Youth Hostel is full of character and nestled near the quaint village of Ilam. A 25 minute walk from Ilam Park, the Dovedale Stepping Stones have remained a huge draw for Peak District day-trippers since they were laid in the mid-19th century. You'll also encounter some of England’s most extraordinary limestone gorge scenery. For a different thrill, the hostel is just 15 minutes from Alton Towers. YHA Ilam Hall comprises 25 rooms with a total of 118 beds. We cater for all, with our family en-suite rooms, disabled access rooms and our more traditional dormitory style rooms. 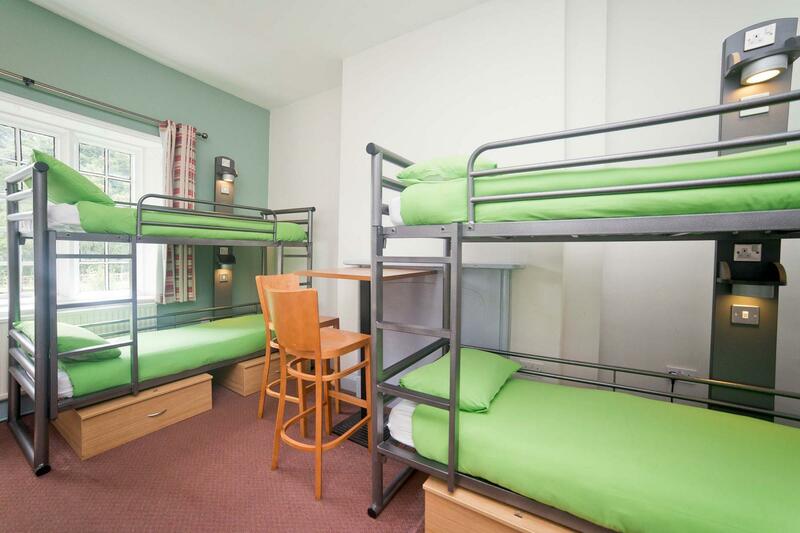 Our rooms all have modern beds with integrated reading lamps and plug sockets and are a mixture of bunk beds and double beds. You'll find plenty of space to store your stuff too! Washing facilities are provided in every room. Don’t worry if you don’t book an en-suite, our clean and modern shared bathroom facilities are a maximum of 10 steps from your room door - we’ve counted! At YHA Ilam Hall we have comfy communal lounge areas, a games room, a bar and reception area with ample seating for guests to enjoy. Our main dining room can seat up to 80 people and we've got beautiful grounds outside to explore. We also have a self-catering kitchen. Choose from our tasty daily specials or delve into our café-bar style menu experience, think scrumptious bar snacks, light bites and loaded stone-baked pizzas. Don’t forget, kids under 10 eat free – get one kid’s meal free with every adult’s meal. Kedleston Hall was designed to be different. Take a trip back to the 1760s to chart the creation of a unique house and park. The hostel is on the doorstep of one of the most beautiful limestone dales in Britain, with trails offering steep cliffs and spires, rare woodlands species and quaint picturesque villages. The nearby Carsington Water offers equipment hire and a range of courses in sailing, kayaking, windsurfing and powerboating for absolute beginners through to instructors. Parking: Parking is free for National Trust members, all other guests can purchase a discounted parking ticket from reception. Pets: Pets are not permitted at YHA Ilam Hall. Assistance dogs are welcome. Wi-Fi and mobile phone signal: There is no wi-fi available at YHA Ilam Hall and no phone signal within the building, so indulge in a digital detox during your stay. If you do need to make a call, signal can be found in some places outside and there is a payphone available if needed. At YHA Ilam Hall we have two meeting rooms available for hire. Capacity: Room 1 can accommodate up to 40 delegates and room 2 30 delegates, depending on seating configuration. Parking: Parking is free for National Trust members. All other guests can purchase a discounted parking ticket from reception. Wi-Fi: Wi-Fi is available in the classroom or the games room. Accessibility: There is step-free access to two of the meeting rooms. One is located close to reception and the other can be accessed via a platform lift. The closest accessible WC is located just off the reception lobby. Unfortunately the last meeting room can only be accessed via stairs. For more information please see our access statement. Air conditioning: There is no air conditioning in this meeting room. Fans and heaters are available. Ilam Hall has a varied history. It was originally built in the 15th Century by the Sir John Port family. After many years in the family, due to finical difficulties the manor and all its land were sold. In the 17th century it was the home of the Russell-Watts family. Under their ownership the building was completely re-designed by architect John Shaw and rebuilt in its current gothic style. Not only did the family transform the manor, they also moved and re-modelled Ilam village. They built new houses for the villagers and a local school. Controversially, they also re-directed the road that used to run in front of the manor, crossing the river at St Betrams Bridge. In the early 1930s, ownership came into the hands of Mr Backhouse. The entrepreneur transformed the building to be used as a hotel and pleasure grounds. Unfortunately the business failed and again the manor was sold, this time to a demolition company. After a few years, most of the elegant rooms and ornate parts of the building had been demolished; the building was saved and restored by Robert McDougal and John Cadbury. In 1932 the reaming 84 acres of land and the manor were donated to the National Trust with the agreement the building was to be used as a Youth Hostel. The Ilam Hall you now see is only a third of its original size and it is mostly the servant’s quarters that remain. Manager recommends: YHA Ilam's lovely grounds stretch to 84 acres of country park on the banks of the River Manifold - great for activity breaks or school trips. Don't miss the short walk from the hostel to the famous Stepping Stones in Dovedale, with interesting caves to explore if you're on a cheap family break; or outdoor games, woodland wanders and riverside walks make a pleasant way to spend an afternoon. Walking holidays in the Peak District wouldn't be complete without a stroll through this beautiful landscape. And, with Alton Towers being so close to your accommodation, there's fun for thrill-seekers and families on the doorstep.